We have a house full of little known history. 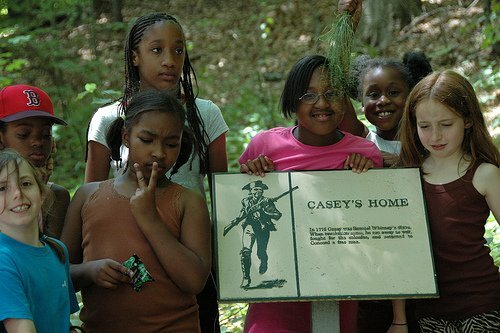 By sharing a house and land, several early Concord African American families were able to support themselves and to lead independent lives. 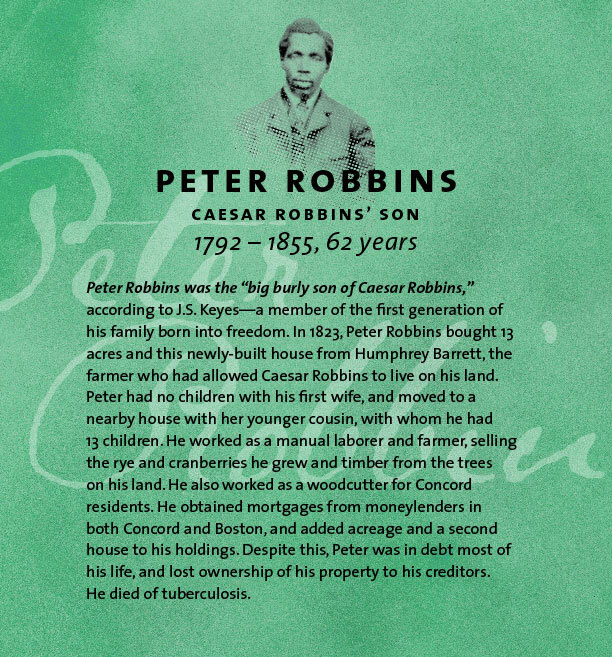 The stories of the occupants of The Robbins House reveal the ways in which the first generations of free Concord African Americans pursued independence and contributed to the antislavery movement and abolitionist causes. 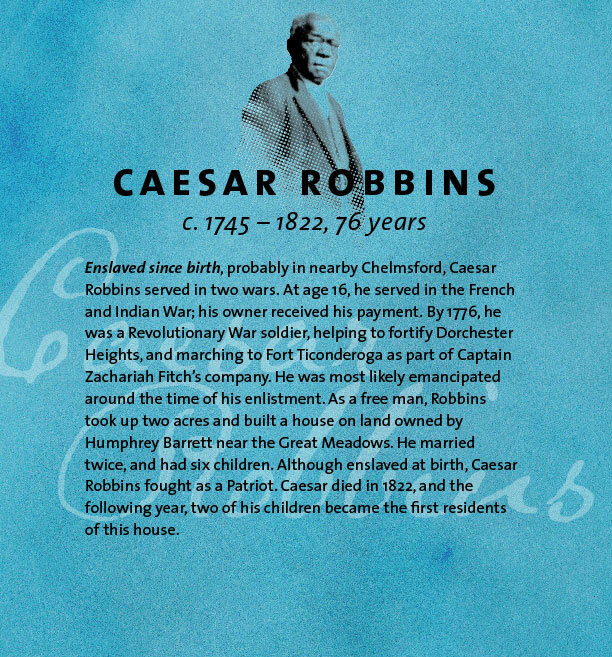 The Robbins House embodies the determination of people like Caesar Robbins to support themselves on the land and to shape their own destinies as free men and women. Frederick Douglass, Harriet Tubman, and Sojourner Truth and John Brown all spoke against slavery while visiting Concord. A slave-owner’s daughter, Mary Merrick Brooks was one of Concord’s leading white abolitionists. Ralph Waldo Emerson was slow to take on anti-slavery activism. In 1844, he and his wife signed a petition 1. Against slavery, 2.Against discrimination, but not against 3. De-segregating the railroads. By 1851, however, Emerson presented an impassioned speech to the citizens of Concord against the Fugitive Slave Law. By 1859, Emerson assisted John Brown, leader of the Harper’s Ferry Raid. Colonel James Barrett was like many other wealthy and titled Concord men in the 1700s in that he owned slaves, including a young man named Philip who is listed in a 1775 militia roll call. For a school assignment, one of Barrett’s sons drew up a mock bill of sale in which he imagined selling Philip to a Cambridge resident. After 25 years of enslavement, Brister Freeman became the second former enslaved person to own land in Concord. Brister’s Hill is named after the area where he and another former enslaved person purchased an acre of “old field.” Brister and his wife Fenda, who told fortunes, had three children. Brister worked as a day laborer and endured frequent harassment from local residents and officials. Impressed by what Brister had been able to accomplish in such a hostile environment, Thoreau compares him in Walden to Scipio Africanus, the great Roman general. Formerly an enslaved woman, Zilpah White lived in a one-room house on the common land that bordered Walden Road. She made a living spinning flax into linen fibers. In Walden, Thoreau notes that, like other former enslaved persons, she too was harassed. He describes her living conditions as “somewhat inhumane.” And yet her ability to provide for herself at a time when few if any other Concord women lived alone was a great accomplishment. Thomas Dugan was a self-emancipated African American from Virginia. He was the third former enslaved person to own land in Concord. He and his first wife Catherine had five children. When Catherine died, Thomas married Jennie Parker of Acton, who may have been born in Africa, and after whom Nut Meadow Brook was renamed Jennie Dugan’s Brook, due to her and her husband’s contributions to the community. Thomas and Jennie Dugan had three children. One of them, Elisha Dugan, lost his father’s land and subsequently lived in the woods. 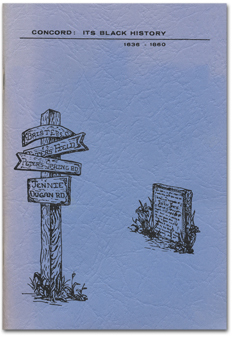 He was memorialized by Thoreau in his poem The Old Marlborough Road. Thomas Dugan introduced the rye cradle to Concord and taught local farmers to graft apple trees. When local squire Duncan Ingraham moved to Medford in 1795, his man Cato asked if he could marry a local (currently or formerly) enslaved person named Phyllis and bring her along. Duncan replied that Cato could marry but only if he stayed behind in Concord, severed his ties with his master, and sought no further financial assistance from him. Cato chose Phyllis over a secure financial future and Duncan thus abandoned him to his freedom, providing him with only a small house and permission to live in it on an acre of sandy land in Walden Woods. In Walden, Thoreau bemoans Cato’s early death. He and his family died of diseases associated with malnutrition. Thoreau was inspired to live in Walden Woods due to these courageous individuals. Did you know that there are many houses in Concord that were stops on the Underground Railroad? That the Alcotts, Thoreaus and Emersons were all antislavery activists? That the sisters, aunts, mothers and wives of those famous Transcendentalists formed the “Concord Female Anti-Slavery Society”? That Harriet Tubman, Frederick Douglass, Lewis Hayden, William Lloyd Garrison and John Brown all visited and spoke in Concord? That some of our streets are named after black residents, such as Peter Hutchinson, Jennie Dugan and Brister Freeman? The First Parish Church, were Frederick Douglass and Harriet Tubman spoke against, and John Brown protested slavery. 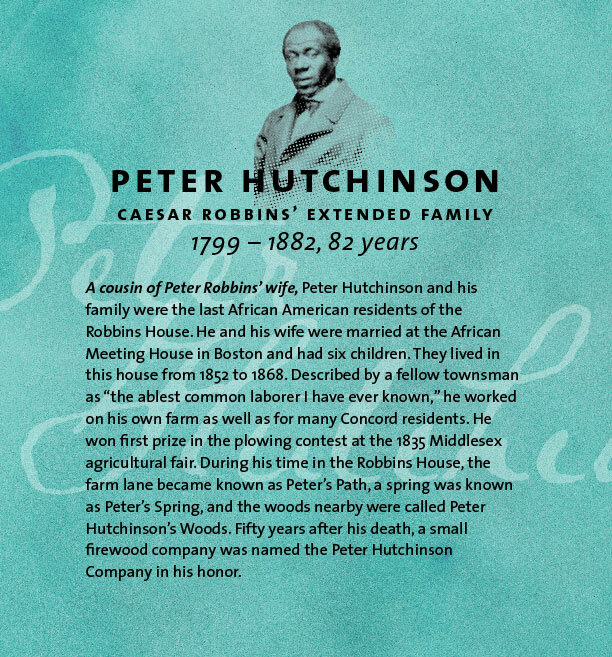 Peter’s Path and Spring, named after Peter Hutchinson, the last resident of color to live in The Robbins House. Jenny Dugan Road & Spring, named after the local wife of self-emancipated Thomas Dugan, and mother of 54th Regiment Civil War soldier George Dugan. Several homes in Concord that served to shelter self-emancipated enslaved people fleeing the south as Underground Railroad sites. 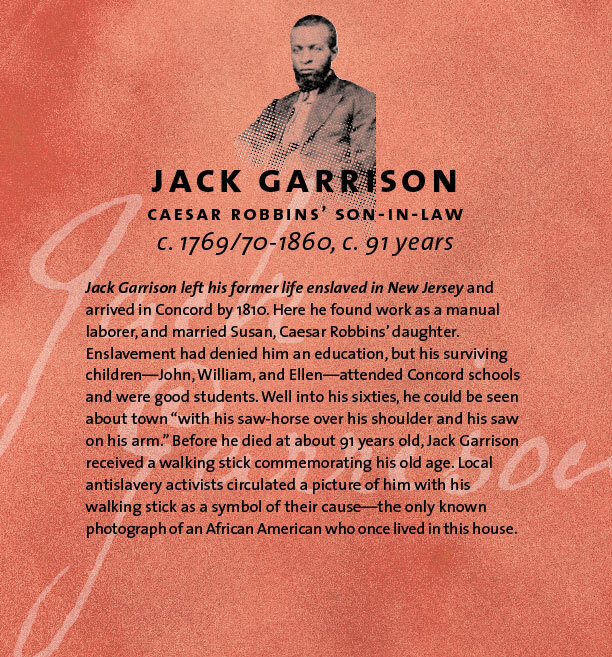 Jack Garrison, a self-emancipated enslaved man and original resident of the Robbins House, has a walking stick and carte de visite showcased in the Concord Museum. John Jack, likely Concord’s first enslaved man to gain his freedom and purchase land and a house, has a world famous epitaph on his headstone in the Hill Burying Ground. 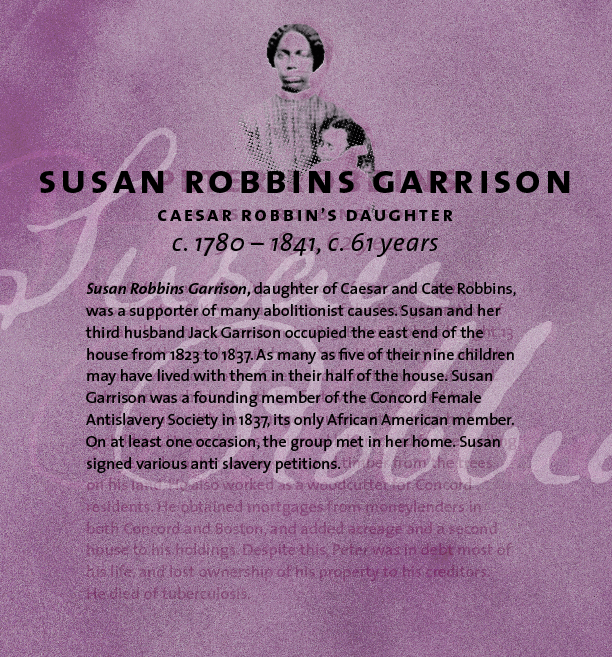 Susan Garrison, original resident of the Robbins House, was a founding member of the Concord Female Antislavery Society, along with Lidian Emerson and the Thoreau women. 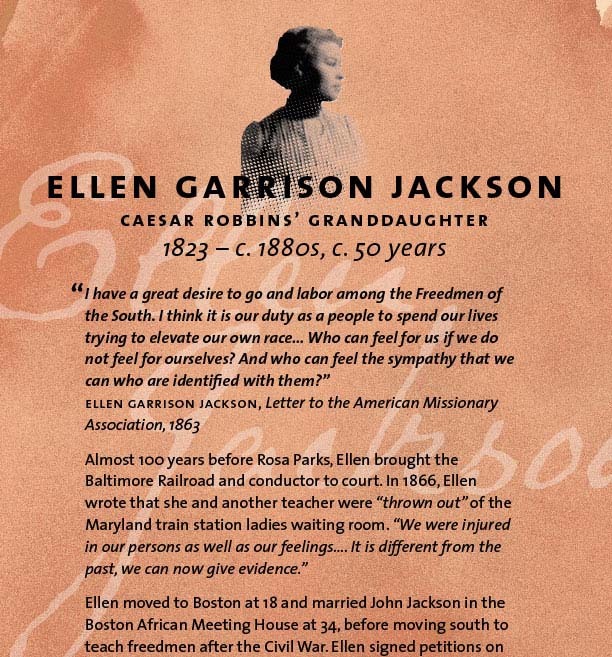 Susan’s daughter Ellen Garrison Jackson went south after the Civil War to teach newly freed African Americans, and had the Baltimore Railroad stationmaster arrested for throwing her out of the ladies waiting room – a test of the 1866 Civil Rights Act. Mary Rice, a Concord kindergarten teacher with a classroom in Wright’s Tavern, sent a petition signed by over 195 children to President Lincoln asking that he “free all the little slave children in this world,” and received a direct response. Shadrick Minkins, the first self-emancipated enslaved man to be captured in Boston after the 1850 Fugitive Slave Law, was rescued and driven to Concord by Lewis Hayden, and sheltered in the Bigelow house across from the Concord Main Library. 1844 – 1st time Ralph Waldo Emerson speaks in public about slavery, at Henry David Thoreau’s Walden Pond cabin. 1863 – Emancipation Proclamation (applying only to states seceded from the union) – didn’t immediately free any enslaved African Americans – changed the character of the war. 1865 – Thirteenth Amendment to the United States Constitution abolished slavery and involuntary servitude.